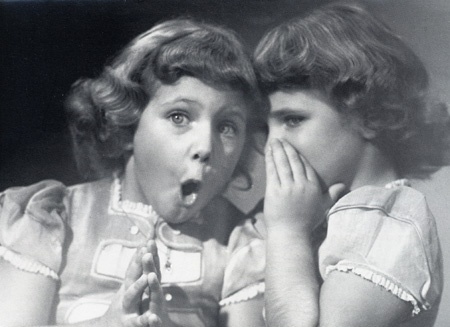 Secret eating is something seldom spoken about or easily admitted. If you ask most people what they enjoy eating alone, without sharing, they generally hesitate with a questioning look. Or mumble that they don’t know. It’s also possible that they’ve never experienced this type of solitary pleasure. The desire to eat unobserved isn’t like bingeing on ice cream or sneaking candy bars to feed your chocolate craving. It’s not comfort food either. It is something you eat surreptitiously, consciously, and quietly by yourself. It is a moment, by choice, of indescribable satisfaction. A survey of extended family members about clandestine eating revealed only one answer close to my definition. It came from my daughter-in-law who is Latvian, with Russian heritage. She formed a covert eating ritual as a child, from about the age of ten. 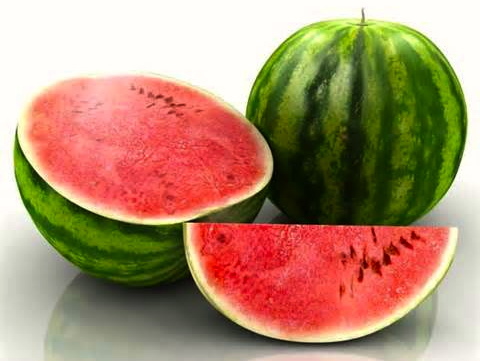 In the summertime, after her parents left for the evening, she would go to the market, by herself, and buy a huge ripe watermelon, with pennies saved or found under chair cushions. Lugging it home, she managed to cut it in two, carried half to the living room, sat on the sofa, watched television, and ate it down to the rind. Spoonful by decadent spoonful–seeds and all. She was not under the watchful eye of anyone, or told to get a plate, or to sit on the floor, or not make a mess. She did it quietly and happily, for her own pleasure. MFK Fisher, of course, has a wonderful story about secret eating. 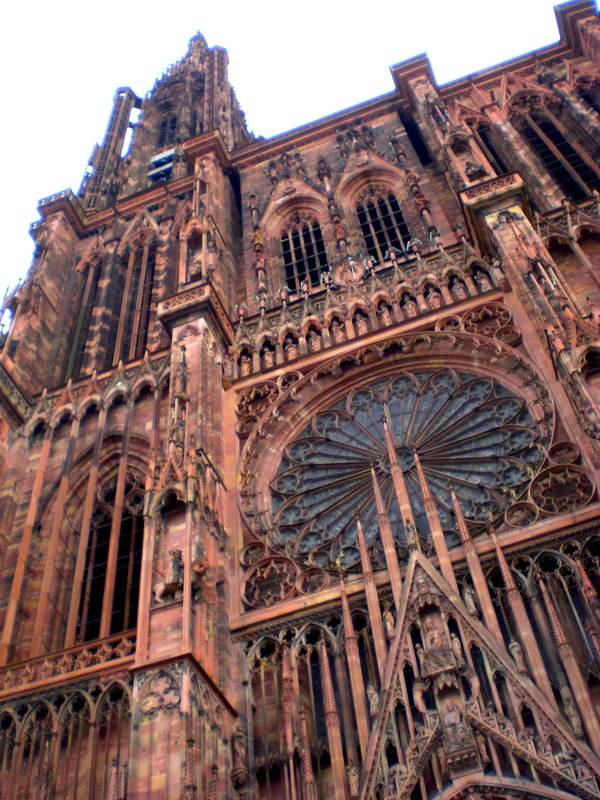 It took place during a frigid winter in Strasbourg, France when she and her husband, Al, lived in an unheated walkup apartment. They grew increasingly depressed by the unending cold, dreary grayness and couldn’t afford to move. So they rented a room in a pension for one luxurious week. 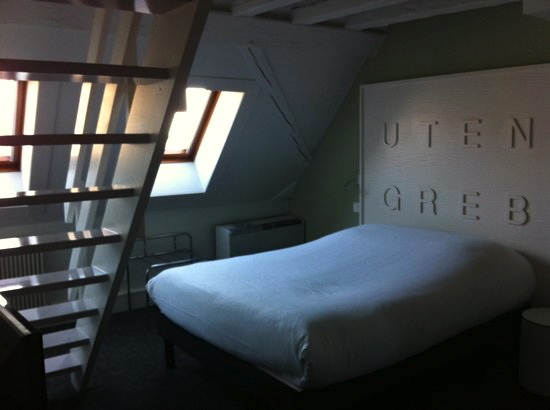 It came with a big bed, billowy curtained windows and, most importantly, heat. Each morning after waving Al off to the university, Mary Frances sat in the window, considering the day ahead. She wasn’t ready to brave the outdoor temperatures. While the maid fluffed up duvets and pillows, murmuring in a thick Alsatian accent, Fisher carefully peeled several small tangerines. Meticulously separating each orange crescent and removing the white “strings” between pieces, she placed the sections on top of newspaper over the radiator. And forgot about them. There was a long lunch when Al returned, and perhaps a wee nip of “digestif” from the decanter in the room before he went back to afternoon classes. By this time, the orange sections had majestically puffed up, ready to burst with heat and fullness. Opening the window, she carefully placed them in the snow on the outside sill. Several chilling minutes passed. Then it was time. For the rest of the afternoon, Mary Frances sat watching the world go by on the street below, individually savoring each morsel slowly and voluptuously. She reveled in the spurt of cold pulp and juice after biting through the crackling skin that was like …”a little shell, thin as one layer of enamel on a Chinese bowl”. She mused while vendors sold half-frozen flowers, children ran home from school, and prostitutes sipped hot tea in a café across the way. Winter’s early darkness descended and the orange sections were gone. She couldn’t exactly say what was so magical about them. Yet she knew that others with “secret eatings of their own” would somehow understand. I read this story many years before we moved to Europe. 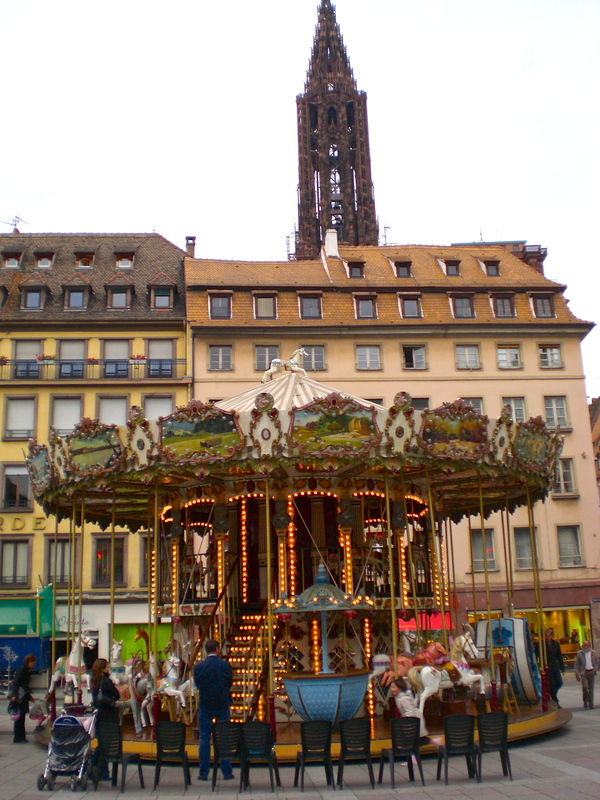 The first winter we lived in Germany, I traveled alone to Strasbourg via the train from Frankfurt. 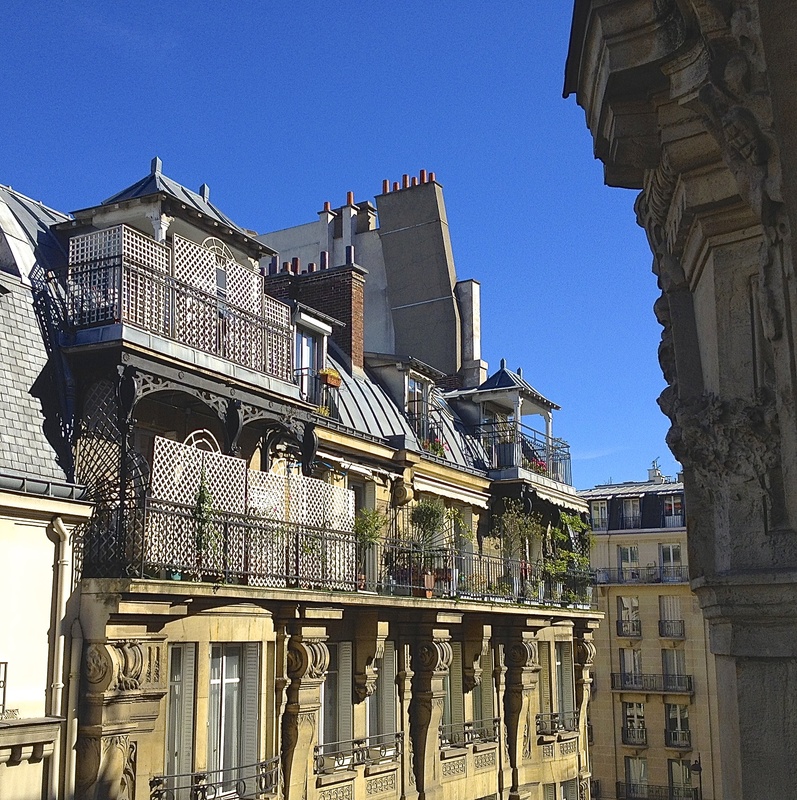 There is a small hotel off Place Gutenberg where I stayed in a room under the roof. 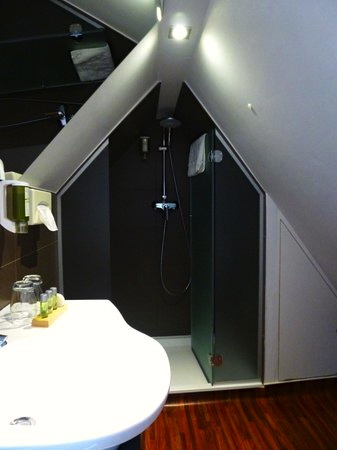 The bathroom was at the very top of the peak–reached by climbing an open staircase with a skylight overhead. 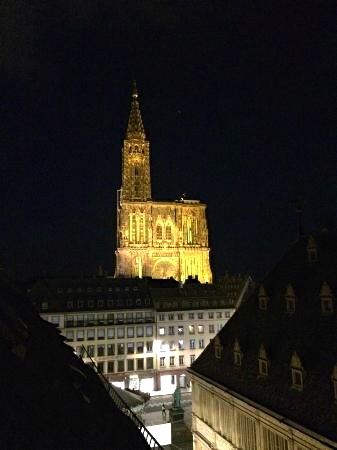 The spire of the Strasbourg Cathedral was visible when I stuck my head out the dormer window. It was a bitterly cold, gray February. I bought a bag of seasonal clementines, peeled them into sections, laid them out on a piece of hotel stationery and left them on the radiator. Then I went out to explore. 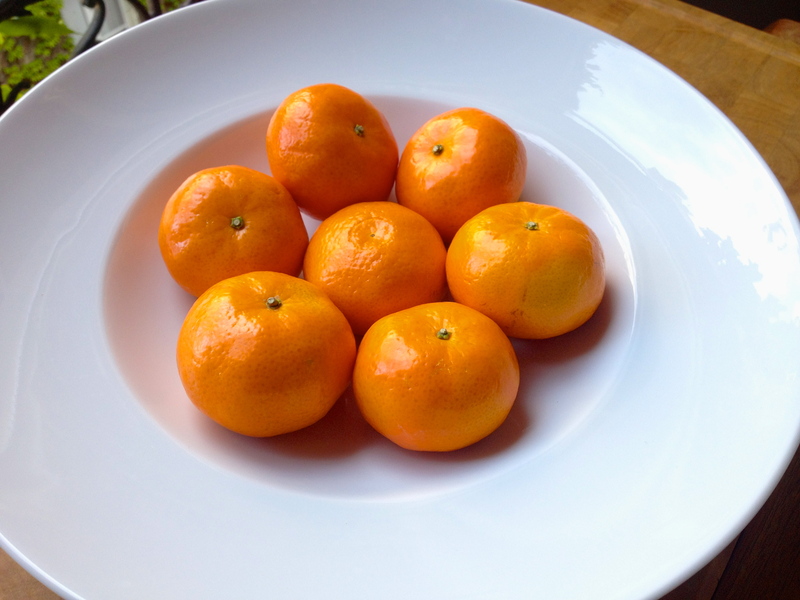 Later, when I returned, the oranges had grown fat and hot, just as Fisher described. There was no snow, but the outside temperature was below freezing. Out on the sill they went. 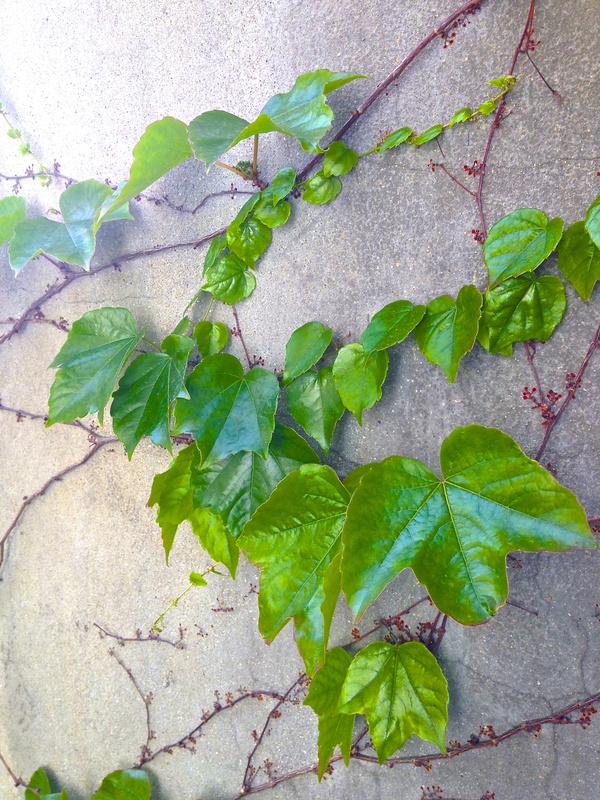 When thoroughly chilled, I ate them one by one in the dim wintery afternoon light. It was true–the skins were crisp and crackling. So thin that, when you bit through them, there was a “pop” followed by the rush of cool juice and pulp. It was a replay moment from the pages of a story by a writer I had long admired. And it made me happy. My current secret eating began during a visit with “Dietitian Daughter” in Colorado. She was buying a snack item for her husband from the bulk bins of a national food chain. I watched her fill a bag with extremely flattened, dull-colored, brownish-orange pieces of fruit. They looked run over by a truck. As it turned out they were unsweetened dried mangos. Dehydrated into stiffened leather. She handed me a piece and said, “Try it”. The first sensation was what it looked like–rough, tough and hard-edged, with the taste and texture of dust on shoes. 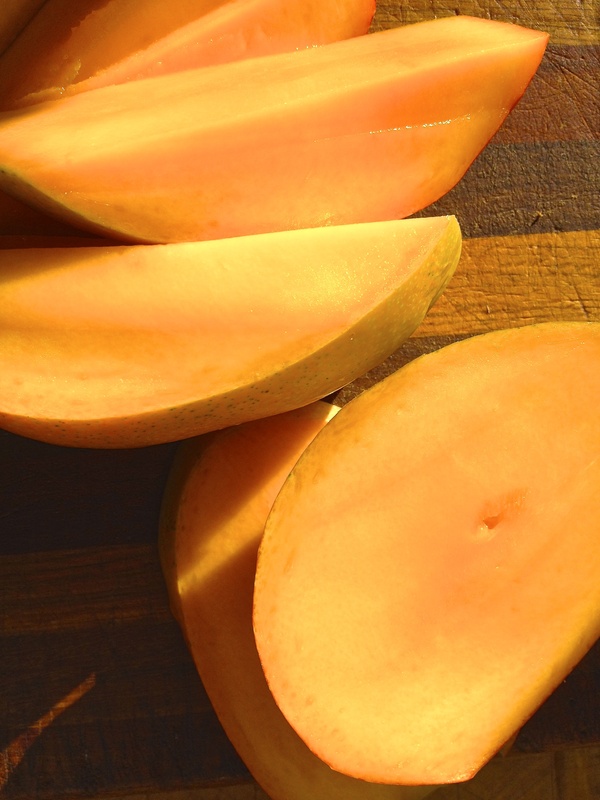 As salivary juices kicked in, that road-kill-looking mango became softer, warmer, and moistly pliable. Careful, considerate chewing brought out interesting changes. It turned vaguely sweeter but held onto the essence of fruity leather. You had to chew slowly, without hurrying, before it was ready to swallow. You had to pay attention. The degrees of subtlety from dry dusty toughness to a satisfying payoff several minutes later completely hooked me. I took my own bag back to Paris. 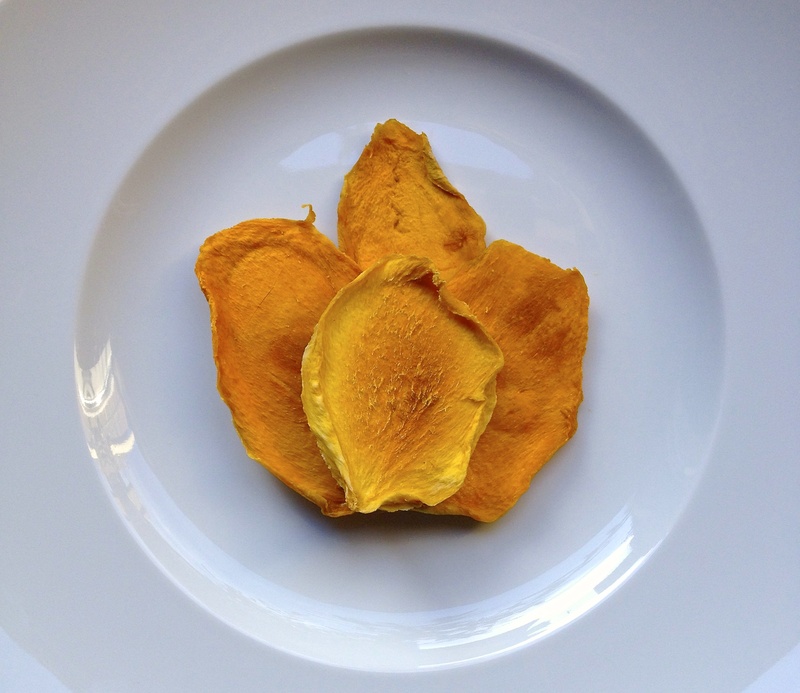 Now when I feel a secret urge, I go to the hiding place and randomly choose several pieces of dried mango. 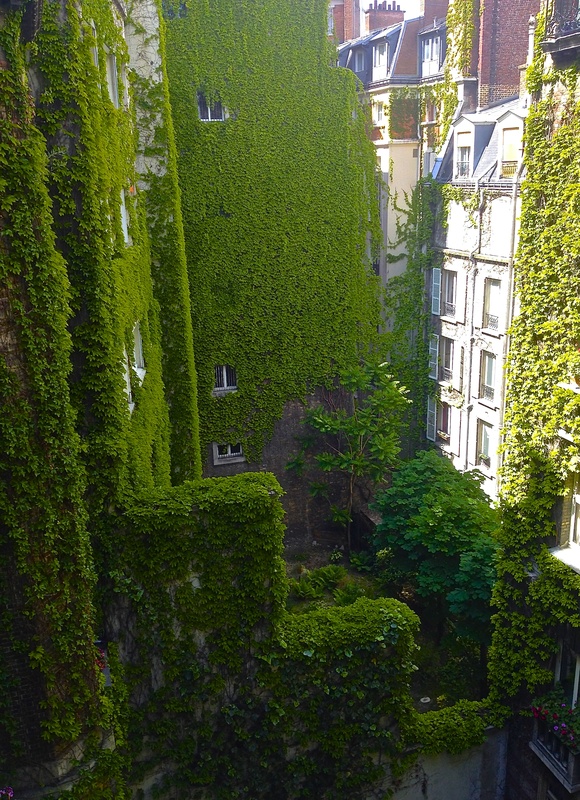 Then I stand or sit in a window of our apartment, often overlooking the vine-laden courtyard, where I never tire of the view. 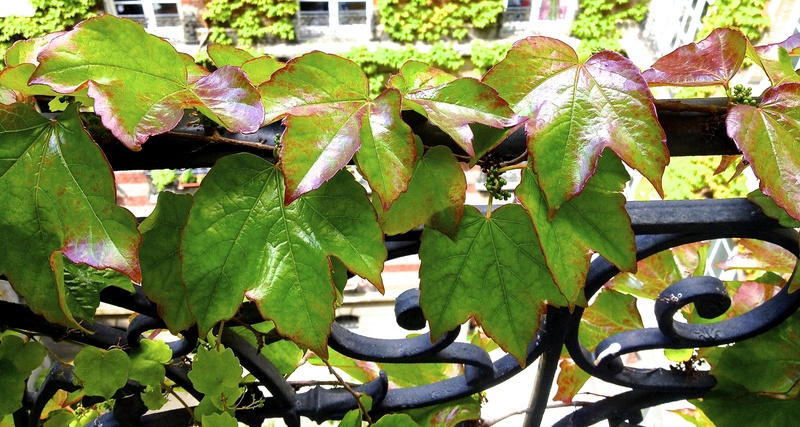 If I stand in the kitchen window during secret eating time, I might muse over the spring unfolding of the Virginia creeper vines or the work-in-progress renovations on the apartment across the courtyard. The neighbour’s cat might be outside on the opposite balcony chirping wistfully at pigeons. 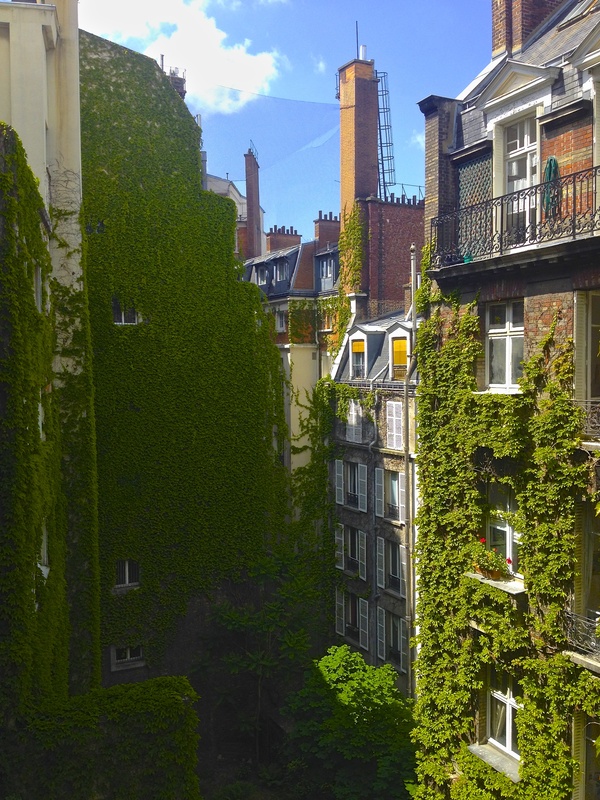 If, instead, I choose to sit in the warm afternoon sun of the dining room windows, I have a private view of sky, rooftops, vine covered brick walls, and my own blooming geraniums. 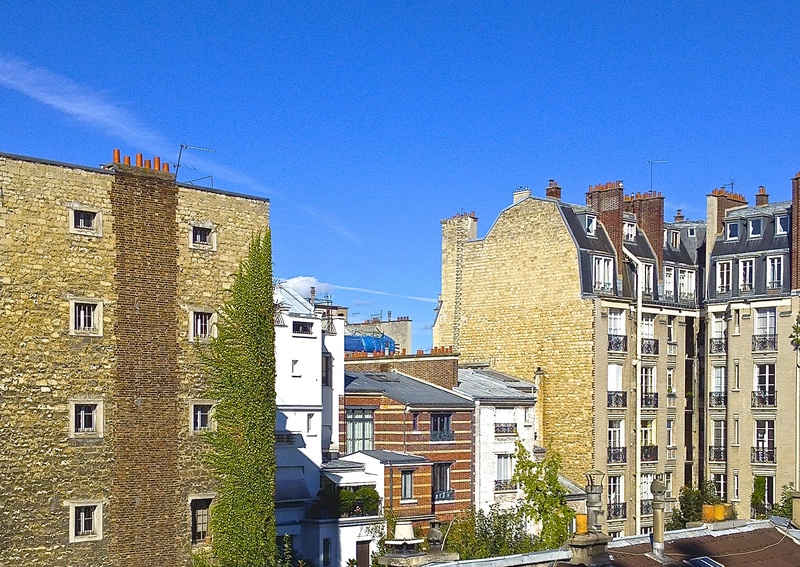 Or, I might decide to stand in the livelier street-side windows at the front of the apartment where I take note of pedestrians, shopkeepers, or a trumpet-playing street musician four stories below. Still, there must be someone out there who understands what I mean? I’m obsessed with flames. Growing up in a family with fire-making and fire-tending rituals, I come by this naturally. 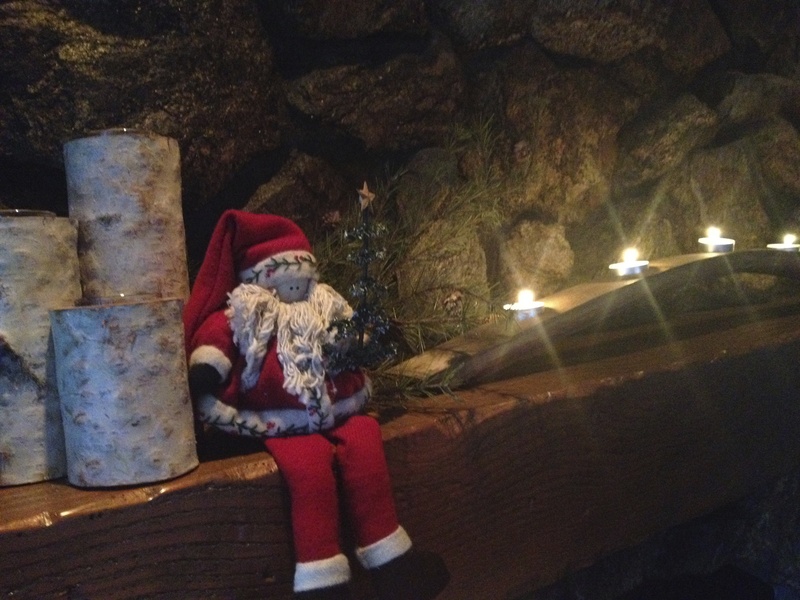 Wherever we lived, when the outside temperature dropped, it was time to lay wood in the fireplace and watch it burn. 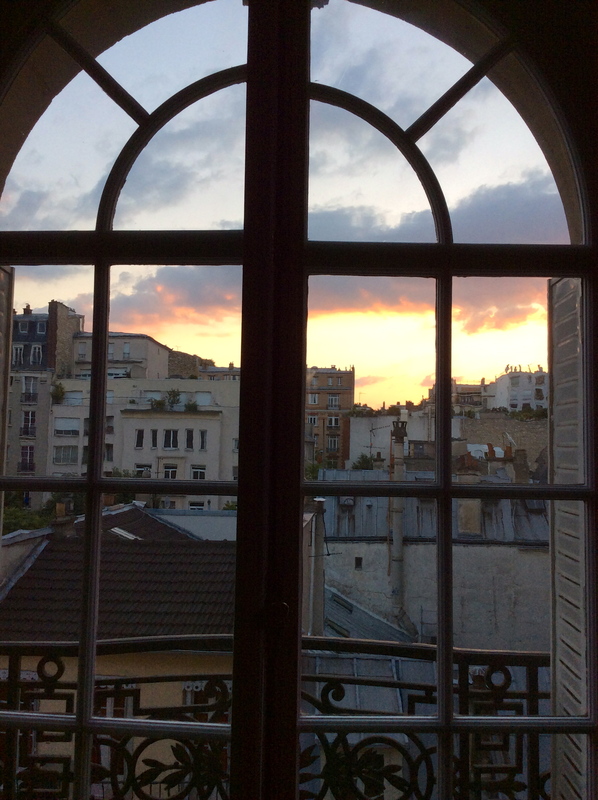 Now I live in a Parisian apartment with seven fireplaces. All of them literally sealed shut. In the dark winter months, there is only one alternative. 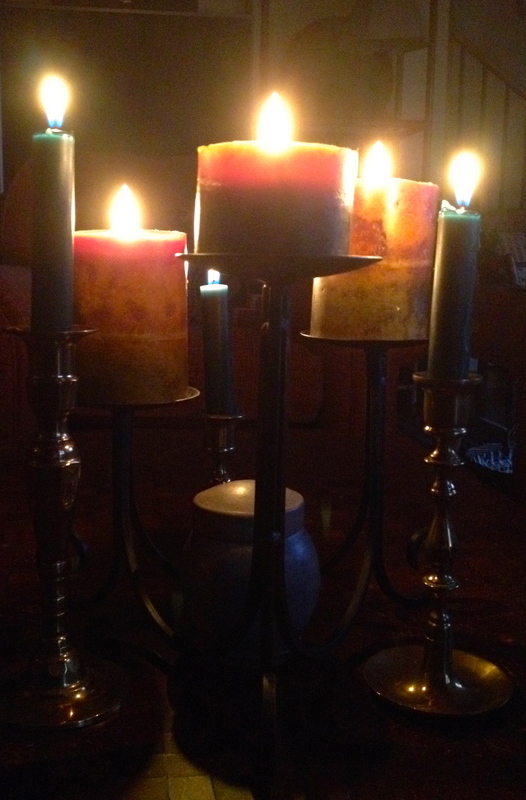 Between four and five in the afternoon, as the sun is waning, I start lighting candles, room by room. Recently, it became apparent that this is not a tradition others follow as consistently as I do. On a late December afternoon, earlier this month, my friend Lesli invited a group of women for “wine and unwind” time. This is when we gather in someone’s home, open a bottle of something and see what conversational banter arises. On this occasion, we met at her apartment. 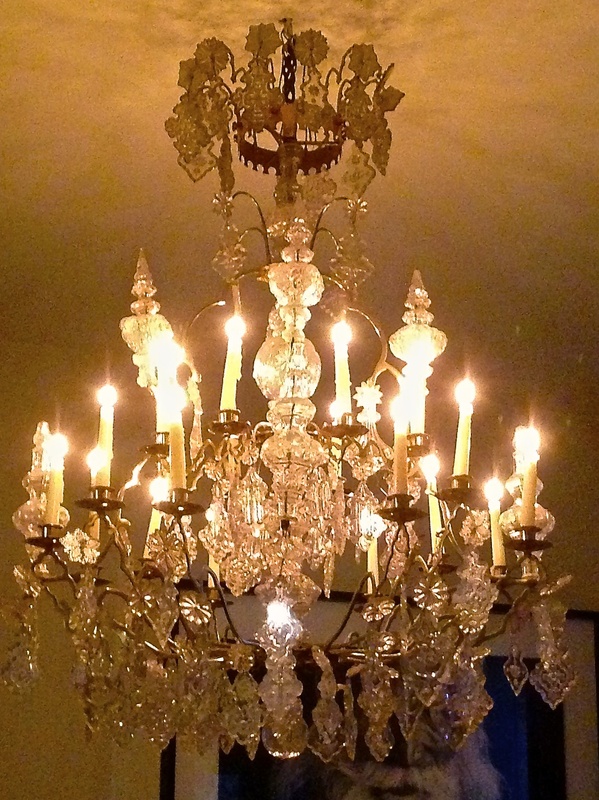 Which happens to be furnished with a spectacular crystal chandelier from another century. While studying it admiringly, I noticed it was not electrified. It was outfitted with white candles. They had never been lit since Lesli moved in, three years before. She needed little encouragement to change this. With partially burned candles already in place, I climbed on a chair and broke off the blackened wicks before re-lighting them. 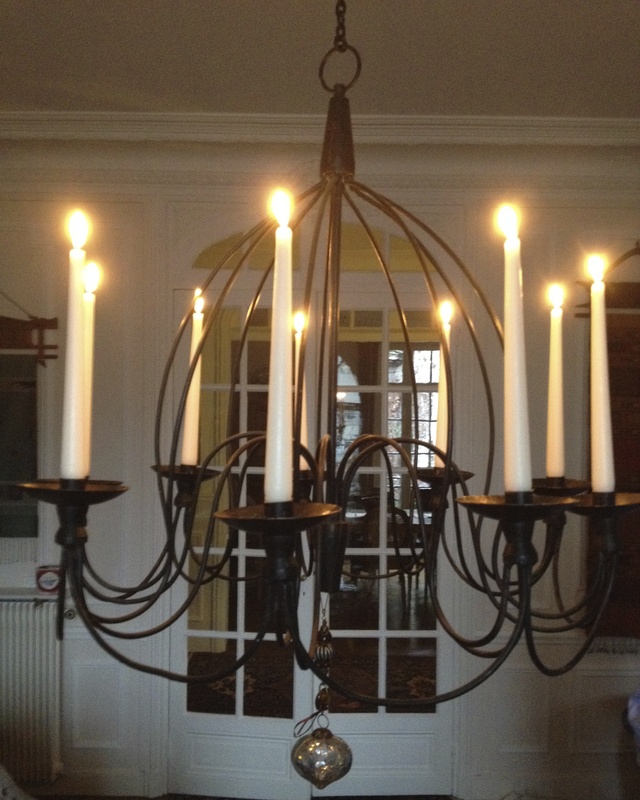 Once in full glow, this antique beauty became a Versailles-worthy candelabra. Although no “ugly duckling” before, it transformed into a stunning swan. She also had six or eight candles in heavy glass jars from the crème de la crème candle store, Cire Trudon. This is the oldest and most prestigious wax manufacturer, since 1643. 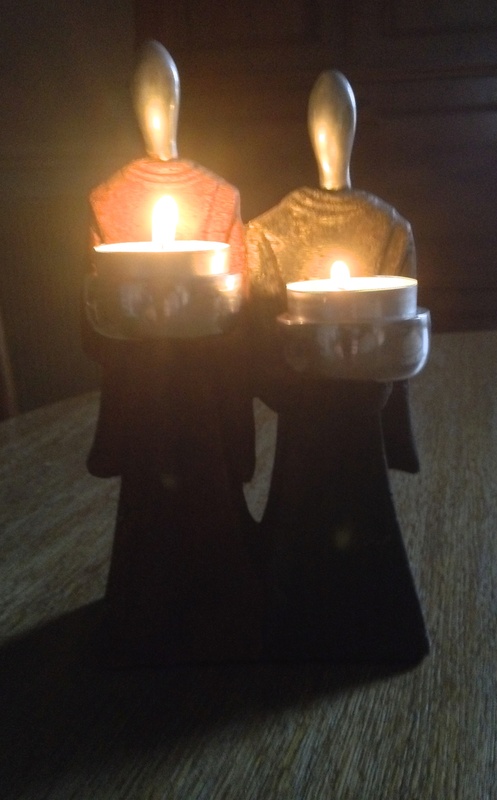 The wicks were deeply buried in hardened wax having not been lit in a long time. It took some digging and trimming, but those, too, were put into active use. 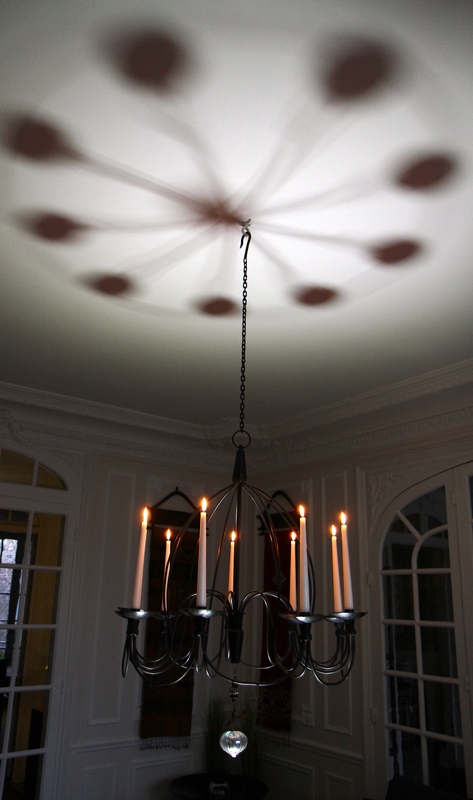 Soon the living room was ablaze with candlelight, bubbling “coupes de champagne”, and good conversation among friends. 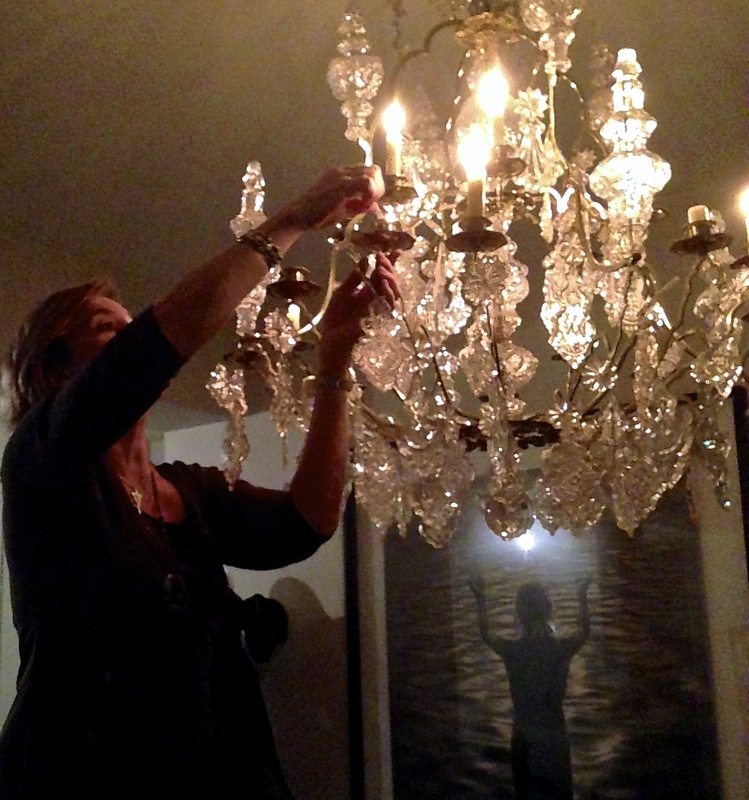 It’s one thing to describe creating ambient light and warmth with candles. The truth is, for many people they are messy and off putting except on special occasions. This is easily remedied by a bit of maintenance know-how. 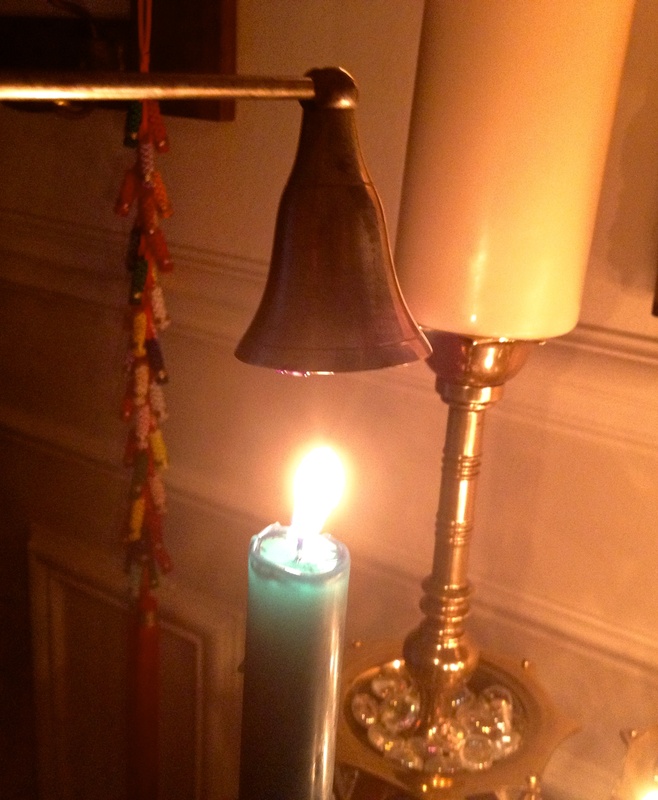 For anyone inclined to light up the night with candlelight, here is the most basic tutorial, as requested by a few friends in France. 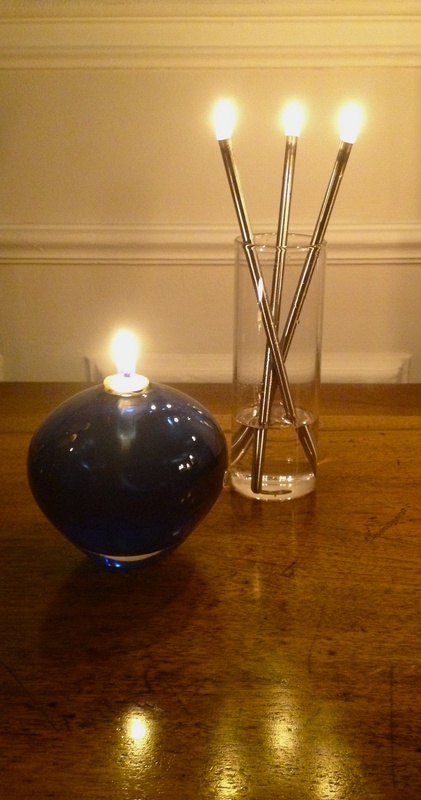 ALWAYS trim the wick before relighting a candle. It will break off in your fingers at the perfect starting point. Otherwise, over time, the smoke from a too-long wick blackens walls, ceilings and pollutes the room. 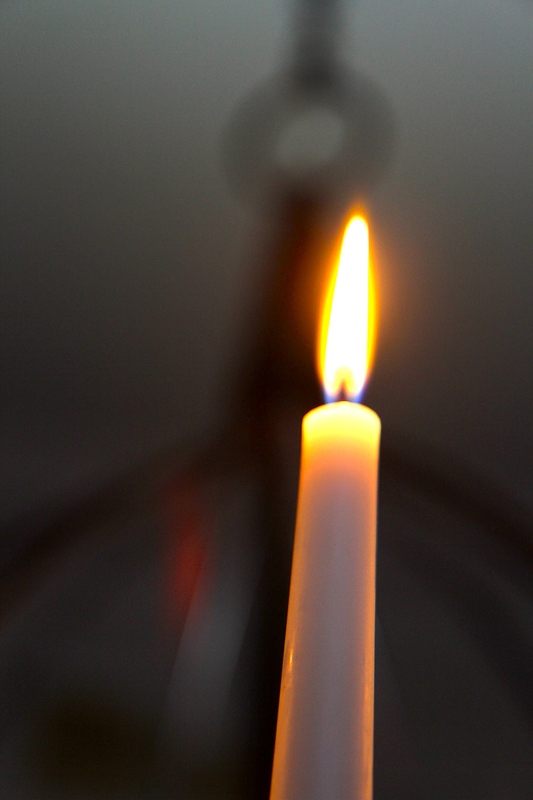 Prevent excessive dripping messes by keeping lit candles out of drafts. 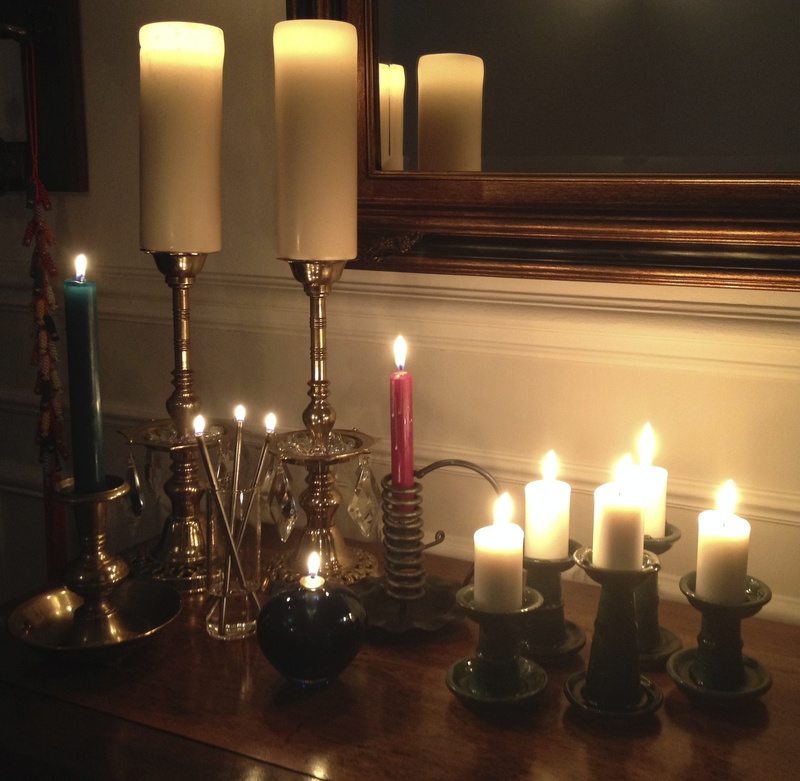 This seems obvious, but it’s really important to be aware of changing air currents wherever candles are burning. For safety reasons as well as dripping. 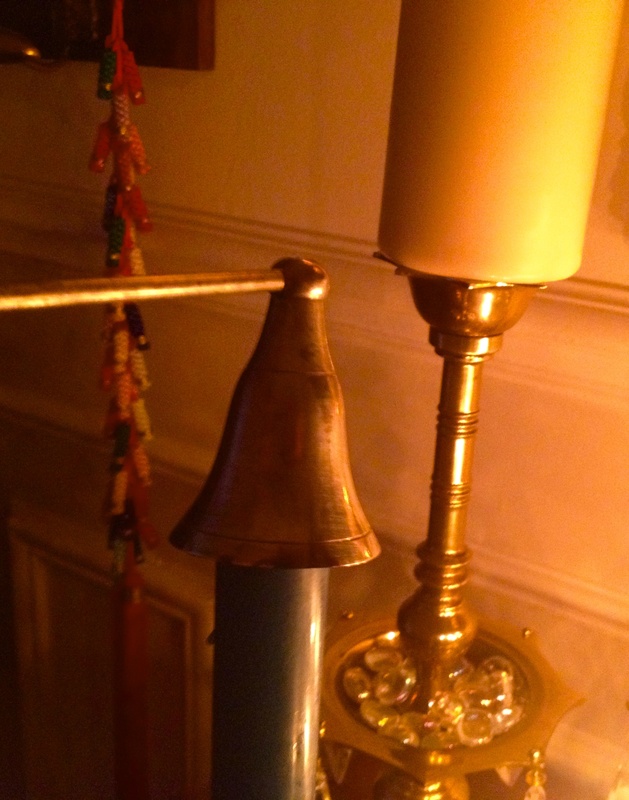 If you light a LOT of candles, it’s better to use a candlesnuffer for extinguishing rather than blowing them out. This dramatically reduces smoke pollution and spraying wax on walls and horizontal surfaces. 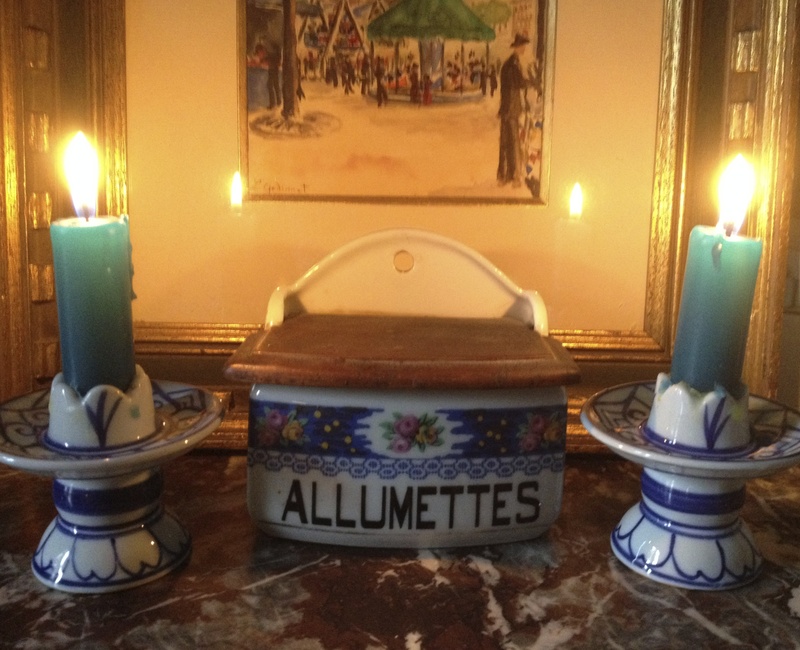 Whether you engage in regular candle usage or not, there is other interesting etiquette to know. Don’t burn candles during the daylight. Candles are for darkness only—morning or evening. Breakfast before sun-up with candlelight is a mellow way to start the day. Evening is natural timing. A candle lit bath can be a regular luxury. When a drippy mess occurs, as it will, consider it part of the experience. A spatula easily scrapes wax from hard surfaces. Hot water does the rest, melting it away. 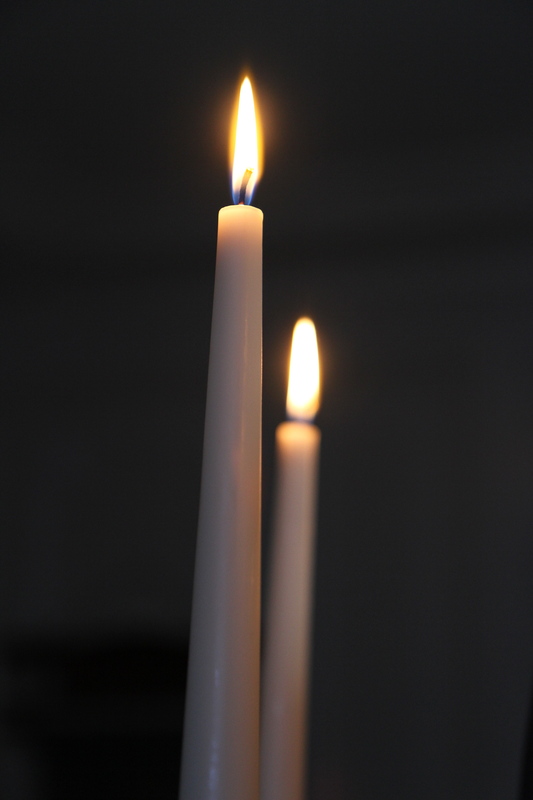 As column-shaped candles burn, empty the wax pool [while it is still liquid] right after extinguishing. As it burns deeper into the column, occasionally trim off the top to make it even with the wick. Use a cutting board and a large knife. This prolongs a natural burning life until it becomes a stump, ready to discard. I can’t explain how fire and candle lore came to be so second nature to me. But, I do believe that our “indoor lives” are enhanced with strategic candlelight. It’s a personal and creative choice as to the selection of candle holders, shapes, and colors. 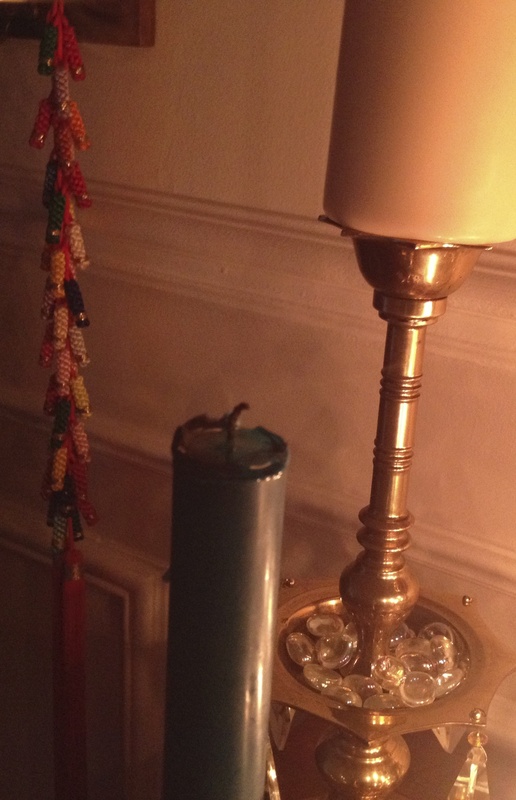 Almost any non-flammable container will hold some type of candle. 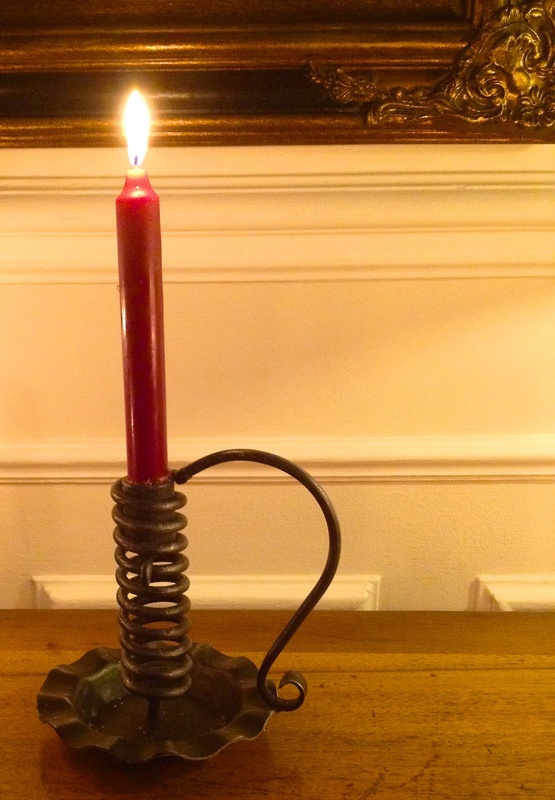 Oil lamp candlelight is a good low maintenance option. 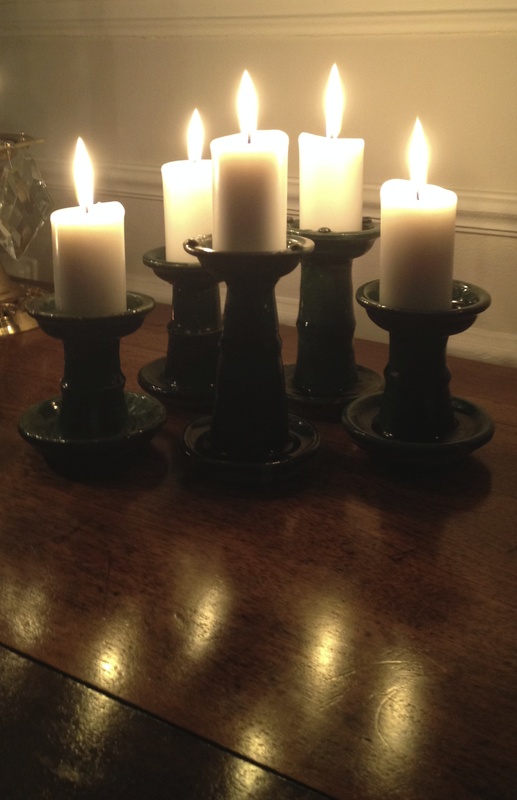 So light a candle or two at home tonight. 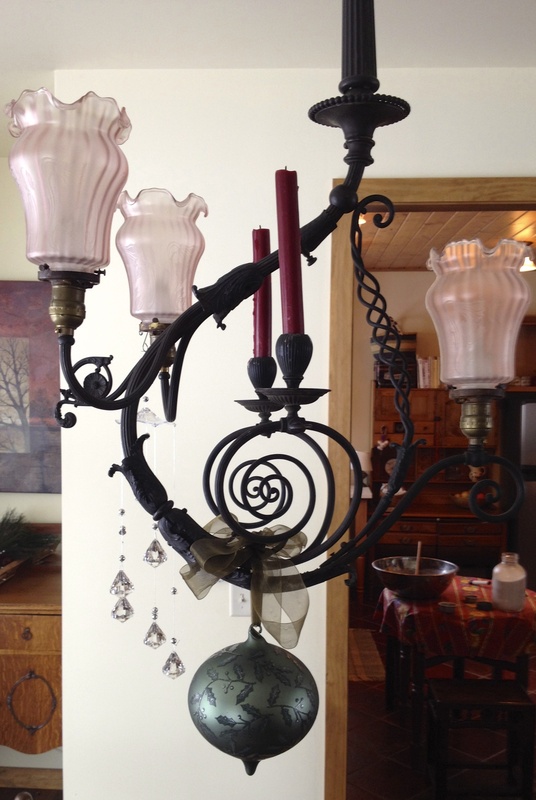 Enjoy a few flickering flames with family or friends. After all, ‘tis the season.